The Catholic Sacrament of Holy Communion of all seven sacraments, the Holy Eucharist, or Holy Communion, is the most central and important to Catholicism. Holy Communion is offered at every Mass, and in fact, the ritual of the Mass is largely taken up with preparing the hosts (wafers made of wheat and water, or gluten-free) and wine to become the body and blood of Christ and the congregation to receive the body of Christ. Transubstantiation is the act of changing the substances of bread and wine into the substances of the Body and Blood of Christ. 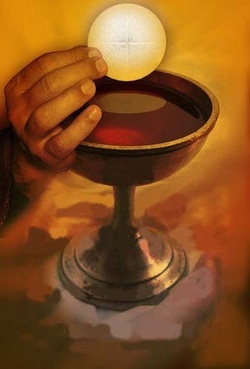 The Holy Eucharist refers to Christ’s body and blood present in the consecrated host on the altar, and Catholics believe that the consecrated bread and wine are actually the body and blood, soul and divinity of Christ. For Catholics, the presence of Christ in the Holy Eucharist isn’t just symbolic, it’s real. Byzantine (Eastern) Rite: Catholics receive consecrated leavened bread (the yeast or leaven symbolizes the Resurrection), which is placed inside the chalice (cup) of consecrated wine. The priest takes a spoon and gingerly places a cut cube of consecrated bread soaked in the consecrated wine inside the mouths of the communicants without ever touching their lips or tongue. Dressing up for your First Holy Communion. When boys and girls make their First Holy Communion (usually in second grade), it’s a big occasion for Catholic families. Like their Baptism, the day of First Communion is one filled with family, friends, and feasting after the sacred event has taken place in church. The children are generally too young to appreciate all the theological refinements, but as long as they know and believe that it’s not bread or wine they’re receiving but the real Body and Blood of Jesus Christ, then they are old enough to take Holy Communion.